Independent Bank Group (Nasdaq:IBTX) announced on October 25 that it was reestablishing a $75 million stock repurchase program. 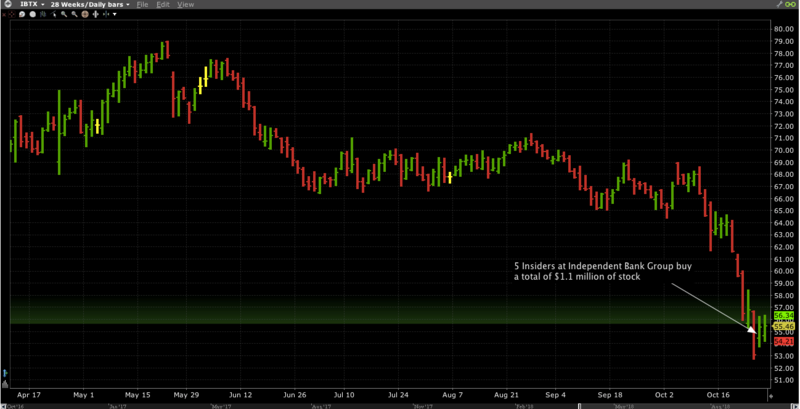 And five corporate insiders responded to the news by buying a total of $1.1 million of IBTX on the open market. Unlike the Independent Bank Group insiders who added skin in the game by increasing their holdings, more often buybacks allow executives to take significant cash off the table by selling into the post-news price bump. If the stock of a company is cheap enough to justify spending corporate cash to repurchase shares, why would corporate insiders sell into the price bump? This practice has the whiff of a pump-and-dump scheme – where a promoter touts a stock with the intention of selling as traders bid up the promoted stock’s price. It’s probably not illegal for corporate insiders to cash out their personal shares after a buyback announcement. But is it ethical? “… studying 385 buybacks over the last fifteen months. We matched those buybacks by hand to information on executive stock sales available in SEC filings. 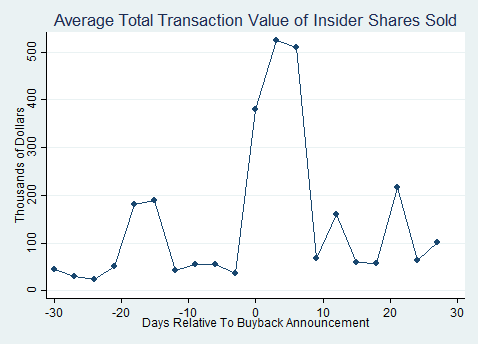 First, we found that a buyback announcement leads to a big jump in stock price: in the 30 days after the announcements we studied, firms enjoy abnormal returns of more than 2.5%. That’s unsurprising: when a public company in the United States announces that it thinks the stock is cheap, investors bid up its price. And they tend to sell in unusually large size. According to Jackson, during the eight days following a buyback announcement, executives on average sell more than $500,000 worth of stock each day—a fivefold increase from their typical selling. Which brings us back to Independent Bank Group, where five insiders spent $1.1 million buying stock in the wake of a buyback announcement. Not only does this this seem appropriate – if the stock is a bargain why wouldn’t they buy? But there’s something else about situations where a company initiates a buyback program and insiders are buying– it tends to signal an attractive opportunity for investors. There are lots banks to invest in, but Independent Bank Group, where corporate insiders are validating the undervaluation implied by a buyback program, deserves special consideration.